Cyclesnack: This bike will hang with the best? Is this guy for real? This bike (if you can call it that) is really just a BSO or Bike Shaped Object according to the blog Commute By Bike. You might recall I had one of these once that I played around with it as a little side project in which I made it into a front rigid 69er and rear suspended singlespeed, that I affectionately called the Dumpgoose. While it was a little small the change in the geometry turned it into quite litterally a comfort bike. It was fun to play around with but I had no serious intentions of keeping it. In fact, I sold it on Craigslist for $25! This guy has to be dreaming if he thinks he can sell it for $200. Here is the link: http://newyork.craigslist.org/fct/bik/869560545.html Send him a note with an offer of $50 bucks and see what he says. 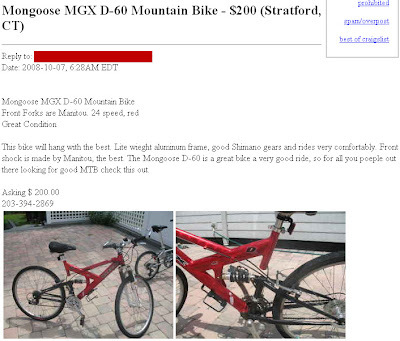 If he doesn't ignore you and comes back at you with some silly retort about negotiations and Craigslist, just let him know that bike is not worth $200 and it's about as durable as a house of cards. In fact, this Magna 15 Speed is more appropriately priced for a BSO. 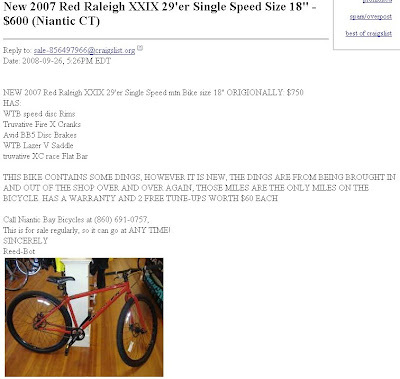 On the flip side, here is a really nice bike for a really nice price and it's of course a 29er! Of course, it's all the way in Niantic but a great price for the Koolaid!